Hello 2018! While we have been quiet in the blogosphere, our office has been in constant motion with not only traditional work, but also our determined pursuit to expand our practice and our body of work through various outlets. As a result, we are excited to introduce our inaugural blog post of a series that will profile certain aspects of our office that go beyond our typical portfolio. We begin with a pertinent topic in Seattle and with which we have a close connection: urban density and the relationship between existing structures and new construction. How harmonious are the need for density, and the desire to preserve urban fabric? At b9 we find the most harmony in thoughtful design impelled by site specific solutions. As the need for density in Seattle has grown, so has the pushback in demolishing the current urban fabric of single family homes. It sometimes feels the default strategy for residential development is to demolish everything that exists on a site and maximize the number of units in a multifamily development. 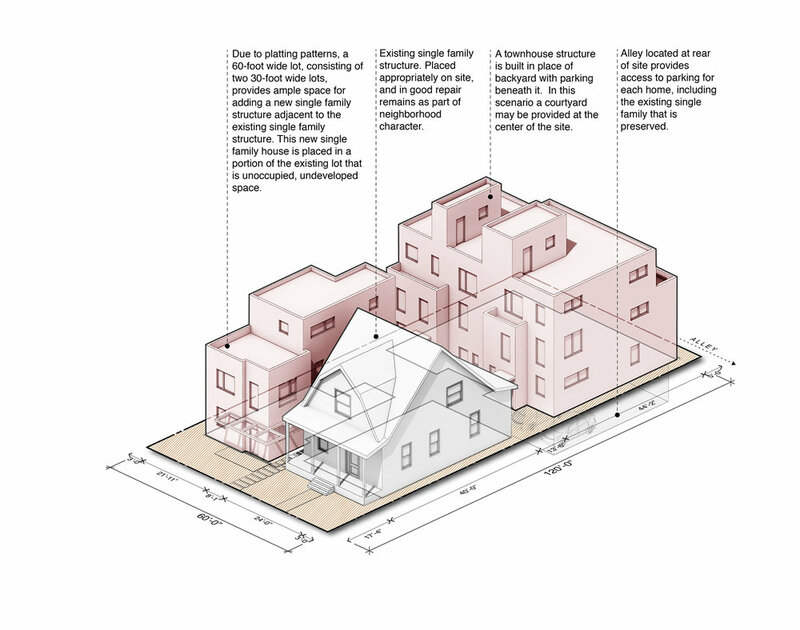 At the beginning of the year, b9 architects examined the history of our work, and we noticed a different, recurring typology: infill buildings that we are calling Urban +. If site and zoning constraints are met, it becomes possible and sometimes financially beneficial to preserve a site’s existing structures while placing new structures in infill positions in current driveways or backyards. Not only does it afford more financial safety to a development project, this typology also allows a developer to maintain existing urban fabric, while adding surrounding density. Our research on Urban + is ongoing, and we will continue expand on the implications and motivations of this urban strategy in the coming months. 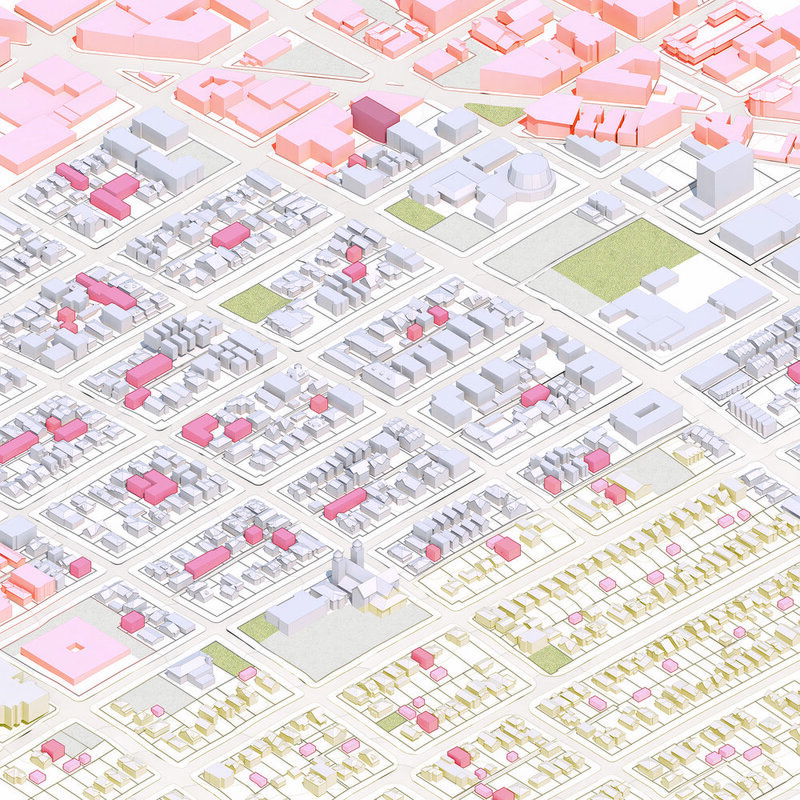 In this exercise we explore the varying scopes of Urban +, the Seattle City zoning and site constraints needed, and the solutions we have designed in this typology. In all case studies, we strived to create a connection to the street as well as a shared communal space between the old and new structures. We defined each strategy based on zoning and the number of lots in question. The smallest scope of this type of solution, the single lot in the SF zone is zoned to only allow a single principal structure and either an accessory dwelling unit (ADU) internal to the principal structure or a detached accessory dwelling unit (DADU). 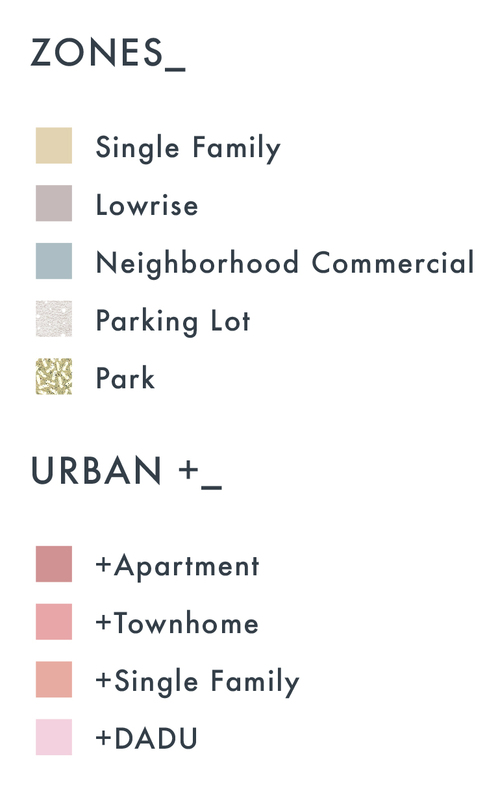 This typology is not yet a viable option for development due to other zoning constraints, and are typically constructed by homeowners looking to utilize the new structure personally or as a rental for additional income. The cost of design and construction makes this typology unfeasible in many cases, causing it to be more of a unique infill situation in the SF zone. On a single lot in Seattle's LR zones, if the existing single family home is in the correct location on site and in good condition, it is possible to preserve the existing home and add a new home on the same lot. This typology most benefits a small developer or a homeowner looking to maximize the lot’s potential and live in a more urban condition while maintaining a limited, or in some circumstances no yard or driveway. This placement of this solution varies based on the placement of the existing structure. If the lot is wide enough, a new SF home can fill an adjacent space replacing the driveway. If the existing home is placed forward enough, a new structure can be placed in the backyard. In this case, adding a two or three-unit townhouse structure is feasible. This saves the existing structure contributing to the street character while adding two or three residential units. This additional density to a neighborhood provides minimal impact on the surrounding lots and existing streetscape. Parking still needs to be considered, as does all development where it is required by zoning. The scope expands as the space does. In a double lot in the LR zone, with access from an alleyway, it is possible to create a single family residence and fill in the dual backyard with a townhouse development. The alley access minimizes the impact of the parking on site, creating more space for shared pedestrian activity and structures. The LR zone has allowances for a triple lot as well. In these instances, it is important to evaluate the existing structures in terms of placement on site, and how well-maintained they are. With this understanding, many solutions can be found in the space surrounding each structure creating a significant amount of density in a more thoughtful way, preserving aspects of the existing urban fabric. In its most significant form, the strategy can be extrapolated to the MR zone. In this case, if an alleyway exists and the existing apartment structure is appropriately maintained and positioned correctly on site, a new apartment structure can be added behind an existing apartment structure. This adds more density and preserves character structures that are strong contributors to the city’s MR fabric. Below is a section of a Seattle area neighborhood at an intersection of multiple zones (Single Family, Lowrise, and Neighborhood Commercial). Here, we tested the potential impact of this typology, and examined the scope of density available to the city. Lastly, we introduced our Urban + analysis at April's AIA Happy Hour, following the theme of "So What're You Gonna Do About It? : Explorations on the Social, Environmental, and Cultural Responsibilities of Design." We had a great turnout in our modest office space and were excited to share our work and values with Seattle's design community. Thank you AIA Seattle for the opportunity to host this fantastic event!